I have a very old backpack (10-15 years old) that is perfect for one day or weekend hikes. The problem is that the inside material has started to peel off and it leaves small bits of yellowish plastic on anything that I put in there. This is specially annoying with clothes, fleeces in particular, because it is very hard to clean-off. I tried washing and brushing but with limited success. Is there anything I can do to save this bag? It looks like the waterproof coating is flaking off. Try washing with a cloth and warm soap and water. I've had reasonable success with this method in the past. Just a suggestion, you could try putting a small amount of something abrasive (such as rock salt or perhaps gravel) into the bag, closing the bag securely with a zip tie on the zipper pulls & placing it in a clothes drier on the Fluff setting (no heat) for some period of time. I tried using Goo Gone on a small portion of a pack like this. It did not work very well. I then tried a rubber cement eraser (It is basically a hard piece of rubber that gathers up loose pieces of the cement for graphic arts work.) That did not work. Renisis was on the right track. I tried a fine grained paint sanding block (Home Depot). That took off some of the stuff. I was also able to get into the corners of the pack with the sharp corners of the rubbery block. But, it was still difficult to get the old waterproofing off without damaging the nylon fabric. The waterproofing is in the fabric. A heavier grained sanding block would have probably worked better. But, you have to be patient, work on a hard flat surface and be careful not to press too hard. Soap / water / kitchen brush (not wire for me) + 30 minutes of listening to good music and scrubbing. A few thoughts. 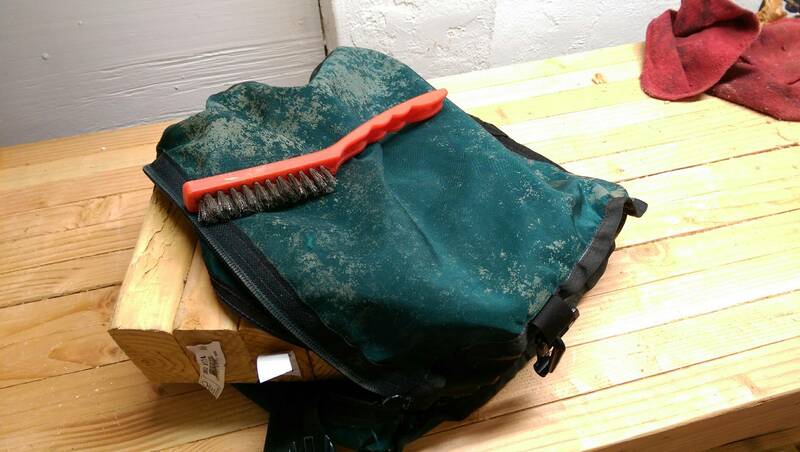 My old Gregory pack started losing its weatherproofing a few years ago, at least in part, due to mold. So, after scrapping off the old material (yes, even in the corners), I treated it for mold (expose it to lots of sunshine, soaked it in a mold killer) Then, I coated the inside with a heavy-duty sealant for tent floors. It was all a stupid crazy amount of work, but so would be earning enough money to buy a new pack. Pack stays dry as a bone now. I am using a wire brush, and putting a wood block inside the bag in order to provide a flat surface to brush against. It's not amazing, but it's working fairly well. Seems better than the other answers here. I had a Lands End duffel with the delamination problem. I turned it inside out and put it in the washing machine using detergent and the hot water setting and that removed most of the urethane coating. I thought better of putting the bag in the dryer. The coating remained fully intact on one panel. I suspect our problem is occurring because of a manufacturing defect on the supply level. My bag has sentimental value, which prevents me from sending it to the landfill. Like the answer from Paul, I scrubbed all messy parts with alcohol using a strong but nylon (or so) brush. It does come off quite ok then. After I impregnated it with a nikwash product. I do love my Lowa backpack, it does carry heavyer loads very well, so I do not want to part from it for now! 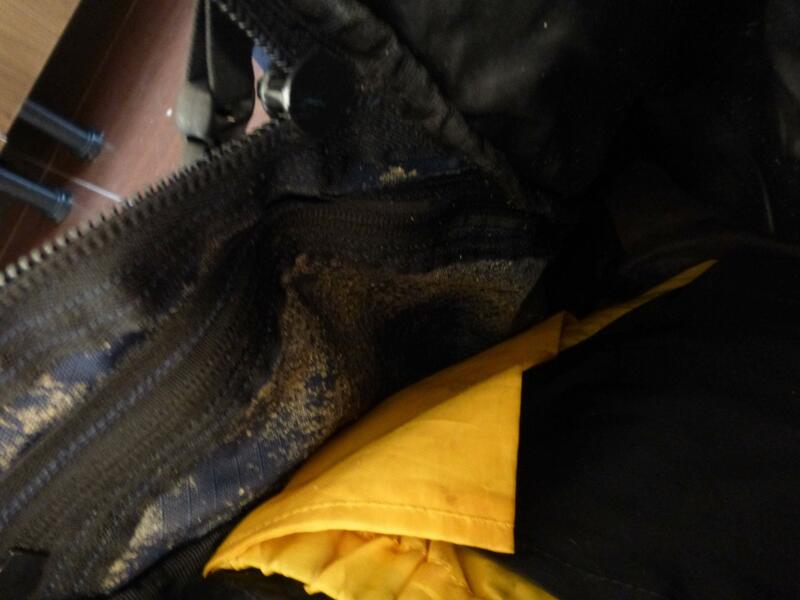 I returned an ll bean pack that I loved but the waterproofing turned to mush,very sticky.I have another ll bean pack doing the same thing so I tried denatured alcohol. It was messy but it cleaned it off very well.now I'll just have to put everything in plastic bags in the pack because there is no more waterproofing. If you could soak it in denatured alcohol,that would work the best. Not the answer you're looking for? Browse other questions tagged backpacks gear-care or ask your own question. What is this brown dust/powder inside my old pack?